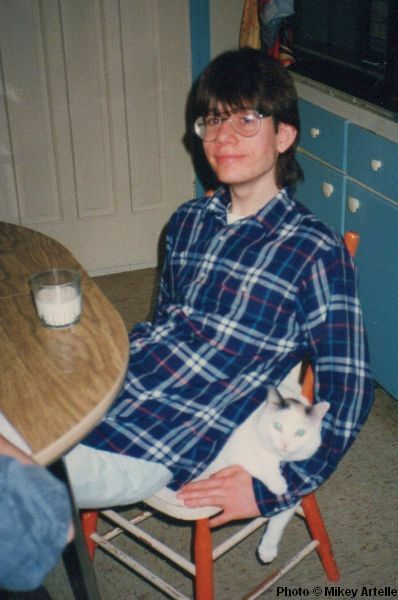 My cat Weeble and I in 1990 or 1991 when I was about 17. In my experience, being a gay kid during the 70s, 80s and early 90s was to grow up with an ever present feeling of fear. I worried about being my true self, worried about what would happen if everyone found out that I was gay, and I worried about just letting down my guard and doing or saying whatever I felt like. In fact I was so wound up that by my mid teens I ended up with intense chronic stomach pain. At times out of the blue I would get such an intense pain in my stomach that I would crouch over and grab my stomach in agony and couldn't move until the pain went away. This became a regular thing, just part of the routine. As such my family doctor sent me to do a barium test so that he could find out if I had an ulcer. At the hospital I had to take off all my clothes and put on one of those backless gowns, then they made me wait in the hall with my dad and the general public until they were ready for me. You see where this is going don't you? Yep! Unfortunately there were no chairs so I had to stand, and being nervous about the test I was pacing the hallway. After a while my dad noticed with alarm that the back of my robe wasn't closed, so he quickly tied it up for me. Ah! ...so that's what those folks were giggling about! So embarrassing! I certainly didn't think it was funny then but now I can joke about it and say what a bummer it was. As for the barium test itself, the less said the better. Trust me! First and last time I ever want to go through that! Thankfully I didn't have an ulcer, none the less this meant that part of my secret was out. My parents now knew that I was extremely worried about something, and my family doctor even ordered me to stop worrying so much. My parents, especially my mom, pestered me as kindly as possible to open up, but I simply told them that I didn't know what I was apparently so worried about. Considering how much of my personality I had supressed back then, it's not surprising that I was worrying my way toward poor health. In addition to the stomach pains, in my late teens and early 20s I experienced a few distinct moments of identity crisis where I would completely forget who I was for a brief period of time. I would remember my name and my birthday and all that stuff, but I wouldn't know who the genuine "me" was. My mind would go blank and I would forget what my personality was like, and what my interests were, and I would also forget that I was gay. I didn't feel any emotion at all for men or women. I became momentarily neutral and blank. The only thing that I felt in those instances was confusion, but then the moment would pass and everything would come back to me and I would remember again. This only happened two or three times, and thankfully while I was at home, but that was more than enough to thoroughly freak me out!